Starring a powerful blend of cold-pressed and unrefined skin illuminating oils, infused with toning and regenerating grapefruit and neroli, this oil fortifies skin’s natural, protective barrier, enhances resilience and promotes elasticity to maintain healthy, glowing skin from top to toe. Ideal for use during pregnancy, or to accelerate healing post-surgery, burns, sun exposure or acne, this is brimming with conditioning rosehip seed and jojoba oils – renowned for their ability to support the production of collagen during periods of skin stress and in turn, minimise the likelihood of stretch marks. 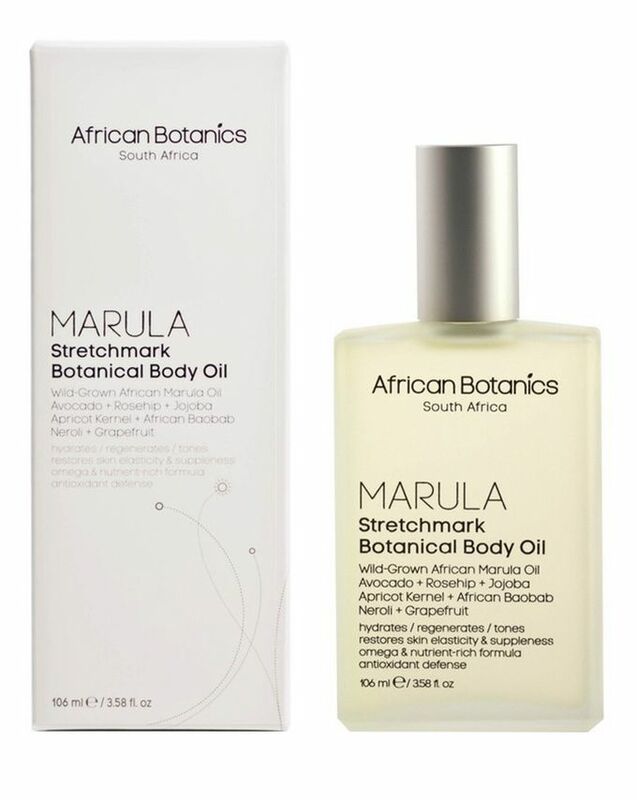 African Botanics’ signature Marula oil – renowned for its (virtually unparalleled) free radical-scavenging properties – then helps to neutralise the damaging effects of oxidative stress, so skin feels intensively nourished, supple, elastic and firm with an even texture and far fewer signs of scarring. A thoroughly modern, all-natural range inspired by old African beauty rituals, African Botanics harnesses the skin-replenishing properties of Marula oil – the world’s most antioxidant-rich oil. 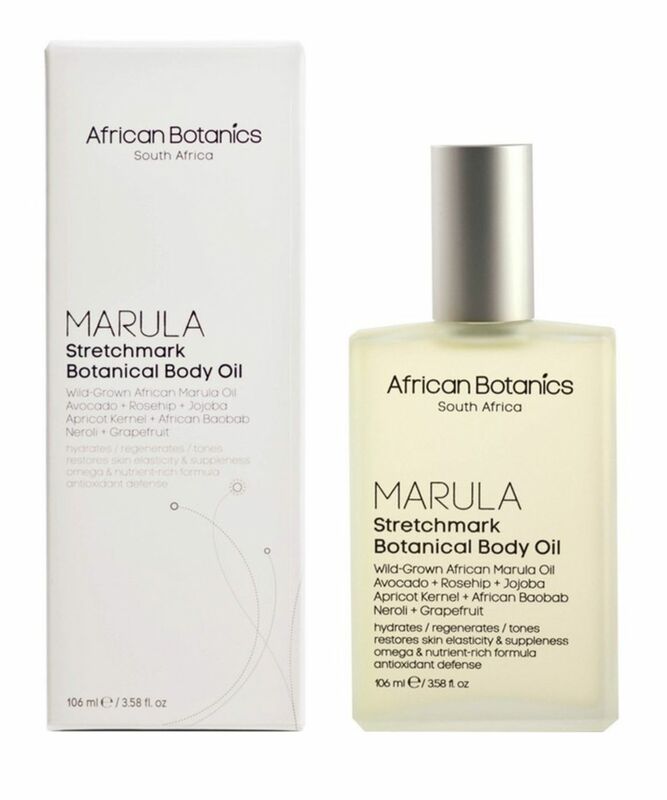 Founded by Craig and Julia Noik – both originally from South Africa – the couple came across Marula on their travels through their native country, and Julia – having recently given birth – was amazed by the speed with which the oil repaired her ‘stretched’, post-pregnancy skin. In fact, the pair were so impressed by its skin-strengthening performance, they persuaded a South African laboratory to analyse its properties – and were bowled over by the findings. Marula oil has incredibly potent antioxidant stability and stars 78% omega 9 to fortify skin’s fabric, reverse signs of damage and protect against ageing effects of free radicals – which is why it is the cornerstone of this exquisite range of face and body treatments. Massage well with a firm circular motion into wet skin for best results. Best to wait until product is fully absorbed before dressing. Use daily. For stretchmarks, exfoliate area first and apply a few pumps every morning and evening. Sclerocarya birrea (Marula Essential Oil)**, Prunus Armeniaca (Apricot Kernel Oil), Persea Gratissima (Avocado Oil), Simmondsia Chinensis (Jojoba Oil), Rosa Mosqueta (Rosehip Seed Oil), Adansonia digitata (Baobab Oil)**, Citrus aurantium (Neroli Essential Oil), Citrus Paradisi (Grapefruit Essential Oil). ** Certified Organic. I'm still using since I discovered to be pregnant and my skin is absolutely amazing without any stretch marks and I'm 7 months and half pregnant!